DOE-I Seminar Notes- Click for details. DOE-II Seminar Notes- Click for details. Project Management (PM) Seminar Notes- Click for details. Production Problem Solving (PPS) Seminar Notes- Click for details. 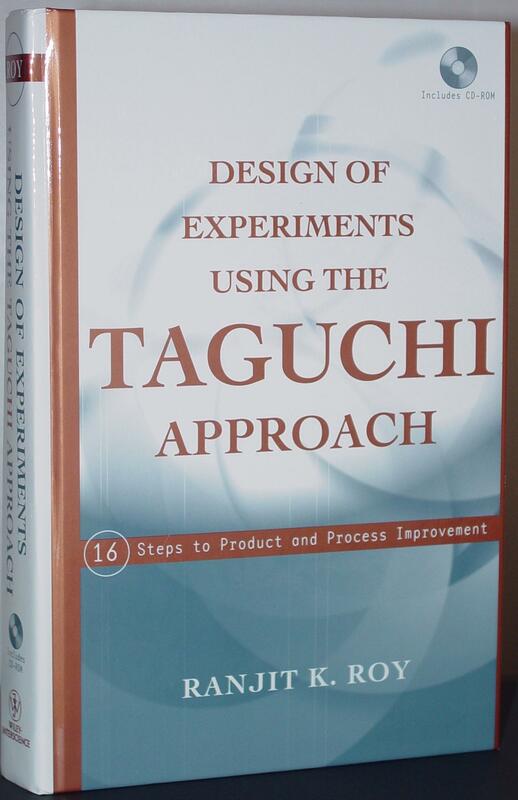 Design of Experiments Using the Taguchi Approach : 16 Steps to Product and Process Improvement by , ISBN: 978-0-471-36101-5. Click here to visit publisher's site and learn more. Down load Qualtek-4 software from Wiley site. Visit the publisher Wiley.com to save 20% on these books and more! Your discount will be applied automatically upon checkout. If you do you not see the discount being applied, please enter code aff20 in the Promotion Code field and click the Apply Discount button. Download and Evaluate Qualitek-4 Working DEMO (Installation/Setup file: http://nutek-us.com/QT4-Setup.EXE). Taguchi's Quality Engineering Handbook - Genichi Taguchi, Subir Chowdhury, Yuin Wu, ISBN: 978-0-471-41334-9, Hardcover,1696 page. Click here to visit publisher's site and learn more. 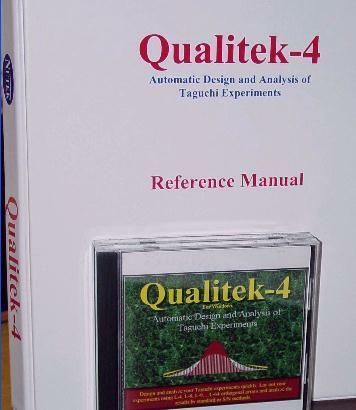 Qualitek-4 software for Automatic Design and Analysis of Taguchi experiments. Click here to learn more and download demo. Down load Qualtek-4 software from Wiley site. 20. Design of Experiments for Process Improvement and Quality Assurance (Engineers in Business Series) by Robert F. Brewer. This book is a self-study guide for DOE/Taguchi technique. "I wrote this book for those of you who feel comfortable learning while doing it, hands-on. After over fifteen years of training and software development experience, I thought it would be a good idea to combine computer in the learning process. I have attempted to take you through the application steps one at a time with several examples in each. All examples and exercises are worked out using Qualitek-4 software provided with the book. As you read the book, you will be able to see all example solutions displayed on your computer screen. If you do not have the time to attend my seminar, you will enjoy the plain language explanation of the application principles. " - Ranjit Roy, Author, Aug. 2000. Should you buy the book and read it, please feel free to let me know how you like it (Call at 1-248-540-4827 or send an e-mail: <Support@Nutek-us.com>). 1. The discussion group (usenet) hosted by Dr Roy is fantastic. If by chance you don't "get it" from reading the book, a simple question posted to the usenet frequently gets you an answer, often within a few hours (its a vocal crowd!!). Many times, the author himself responds to usenet questions. And, on at least one instance, after I repeatedly asked my question, he began exchanging emails with me, which then led to some pleasant phone discussions. 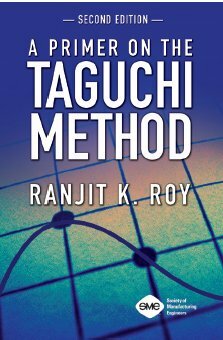 A PRIMER ON THE TAGUCHI METHOD is a practical guide which introduces you to the basic concepts, techniques, and applications of the Taguchi approach, in a clear simple, and essentially non-mathematical presentation. Appendix:Orthogonal Arrays, Triangular Tables, Linear Graphs, F-Tables, Glossary & References. Review flyer for ordering information. 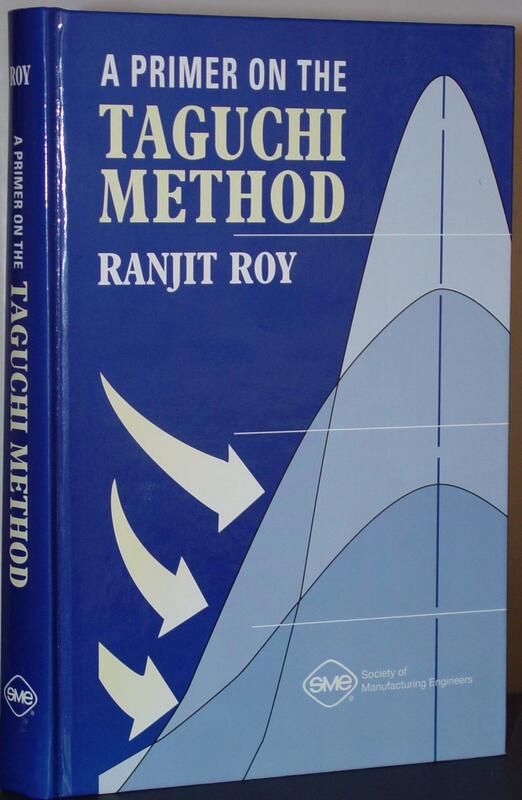 Design of Experiments Using Taguchi Approach: 16 Steps to Product and Process Improvement - Ranjit Roy (ISBN: 0471361011, Published by John Wiley 2001, also available as eBook version). To place an order or to request information, write, call, fax, John Wiley & Sons, 605 Third Avenue, New York, NY 10158-0012. BUY: Click here to purchase this book from the publisher.